The Customs House in South Shields. A theatre in South Tyneside has received almost £10,000 in lottery funding to run creative projects for youngsters. 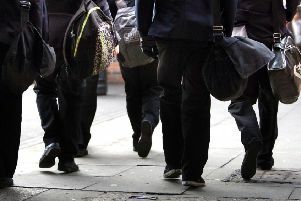 The Customs House in South Shields is to stage three term-time schemes specifically for looked-after children in the borough. Elizabeth Kane, learning officer at The Customs House. Called The Treasure Group, they will work alongside professional artists and visit arts events, and those taking part will also have the chance to achieve an arts award – a nationally-recognised qualification. Elizabeth Kane, learning officer at The Customs House, met with Big Lottery funding officer Linda Yeo late last year to talk about the work of the group, which works with children who are fostered or have experience living in care. The Customs House has run projects for looked-after children since 2010 – originally as part of a national pilot project with Arts Council England, South Tyneside Council fostering services and The Place – Project for Looked-After Children’s Education. Elizabeth was advised to apply for an Awards for All grant from the Big Lottery Fund – and the theatre has received £10,000. Elizabeth said: “I was so happy we were successful. While writing the bid, we talked about how this project will really develop the children’s confidence and self-belief. “They, like all young people, can make great work and achieve great things. We also want our community to celebrate their achievements. “After each project we will have a showcase event to share what they have achieved. If they do a visual art project we would host an exhibition. “If they do a writing project we might publish a book. It all depends on what they want to do. “The Big Lottery Fund has given us an incredible opportunity to work with children over a year and make a positive difference to them as individuals and our community. The year-long programme will start in March. For more information about The Treasure Group, email elizabeth@customshouse.co.uk.